Spring is a BEAUTIFUL time on the river! 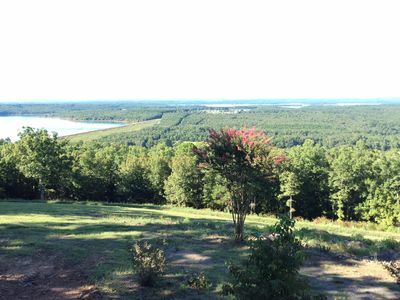 Come relax here for peace. 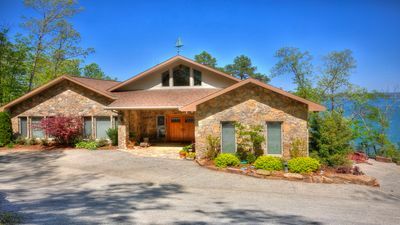 This "Star" retreat will surround you in the privacy and luxury that you have longed for and deserve. 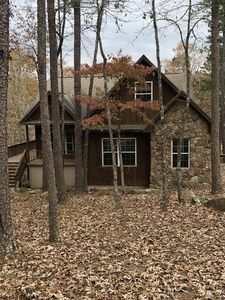 The "Hollywood Hills Cabin" is the newest addition to River Hideaways exclusive Little Red River retreats. 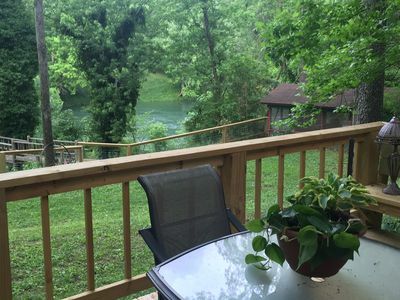 This beautiful cabin sits on 3 private acres and faces over 400 feet of river frontage. 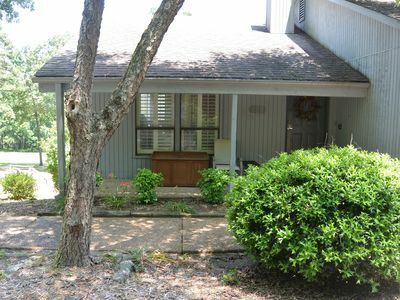 The rear of the property is surrounded by a tranquil horseshoe pond. 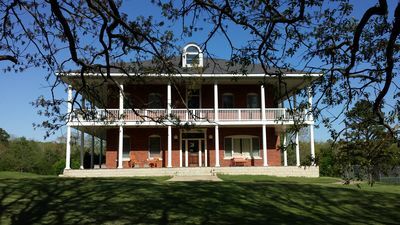 The acreage is abundant with full growth trees and landscaping. 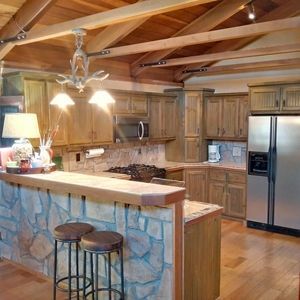 The property boasts a separate outdoor kitchen and family sitting/dining area fully screened. 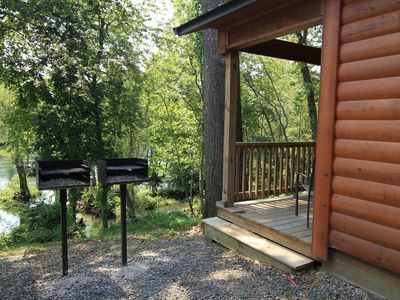 The cabin has a large deck on the front facing the river and also has a walkway with a floating boat dock that you can fish right off of. 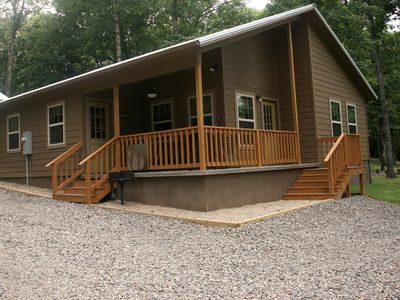 The cabin has a private master bedroom with a king size Temporpedic bed. 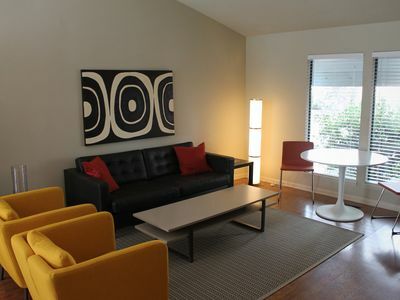 There is ample space in the den with a queen size sofa bed facing the wall of windows that overlook the river. It is a picturesque scene early in the morning with the mist rolling off the water and through the heavy vegetation on the riverbanks. 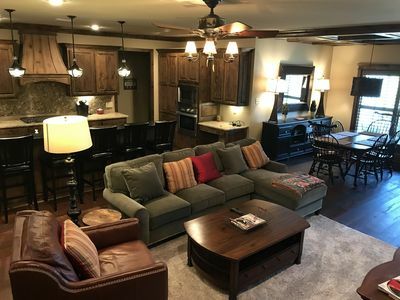 There is a separate upstairs loft with two single beds that is accessible from a stable ladder with to the separated space , bedroom side and private sitting area. 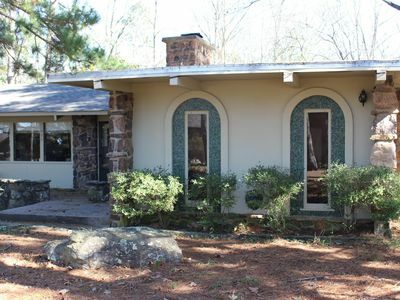 Both sides have windows with beautifyl views of the property from every direction. 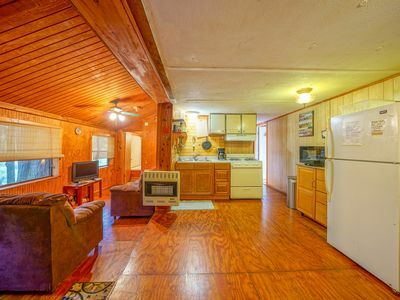 There is a fully stocked kitchen with all of the amenities and a breakfast dining nook for four. The interior is styled in the theme of "Hollywood" with famous movie posters, movie photos and vintage items of a by gone era in American cinema. 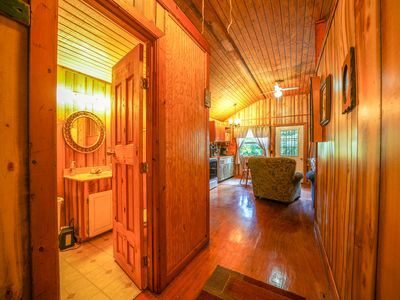 The cabin has many unique artistic touches that set this property apart. The decor reflects our version of Hollywood glamour , from the period movie posters, the autographed Actor photographs, as well as the more unusual items such as the theater spotlight that is in the den. Every where that you turn, there is a glimmer of the lights of Hollywood, from the golden steps up the ladder that are reminiscent of the yellow brick road, to the jeweled furniture. 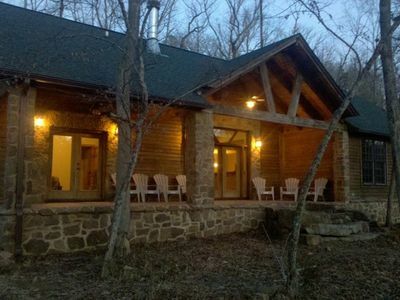 This cabin is a perpetual work of art in progress that will only continue to improve. 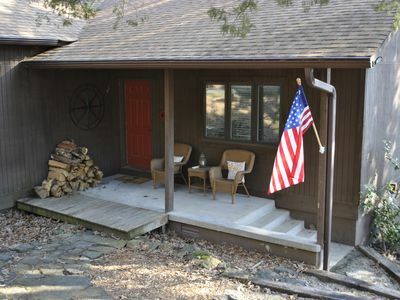 This property is located in a great part of the Little Red River for trout fishing year round. 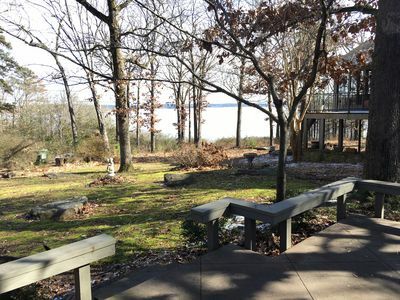 While you are totally secluded in the privacy of nature you are still only seventeen minutes from Walmart and downtown Heber Springs. There are a variety of shops and good restaurants in the area. Wild life abounds in this part of the country so be prepared to see lots of animals - creatures small and large as well as many types of birds, including eagles. 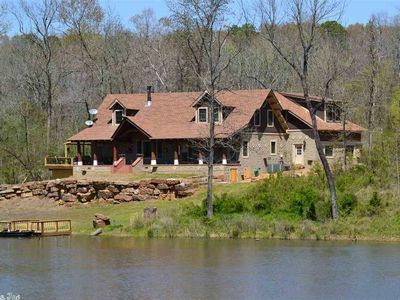 Gorgeous Lakefront Home perfect for Large Groups - Pets and Children welcome! 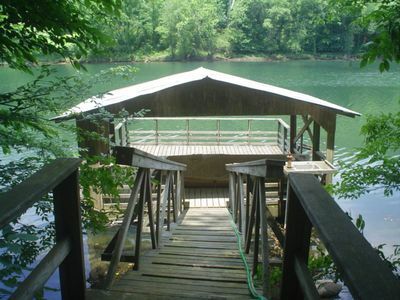 Woolly Bugger River House On the Little Red and next to the Lake. 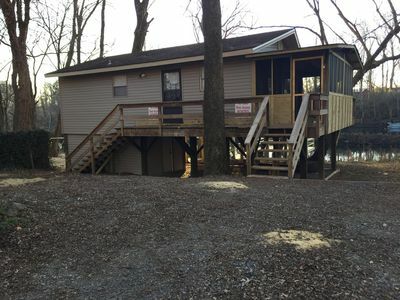 Riverfront Cabin on Exclusive Jon's Pocket! 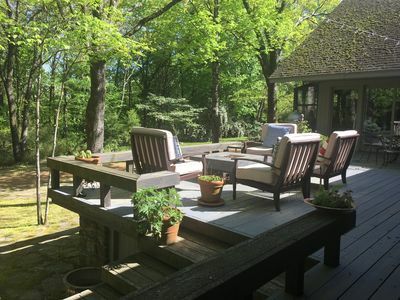 The Retreat at Foxchase- a perfect getaway on Eden Isle.